More than a third of Americans who have a credit card that earns travel rewards (34%) say they often overspend on the card in order to earn more points or miles, according to a new NerdWallet study. This is most true for millennials (50%) compared with Gen Xers (37%) and baby boomers (19%). But overspending is a critical travel credit card mistake: Within months, your interest charges will outweigh even the highest travel rewards if you don’t pay off your credit card by the due date. Instead of overspending, try these three ways to boost your travel rewards. The easiest way to rack up rewards without overspending is simply to use your credit card for all of your everyday purchases. It’s spending you were going to do anyway, and if you pay your bill in full each month, you won’t pay interest. A 2017 NerdWallet survey found that only 34% of Americans primarily use a credit card, rather than a debit card or cash, for everyday expenses such as groceries or gas. But if you’re using a credit card only sparingly — just for online shopping or major purchases, for example — you could be leaving hundreds of dollars in potential rewards on the table. 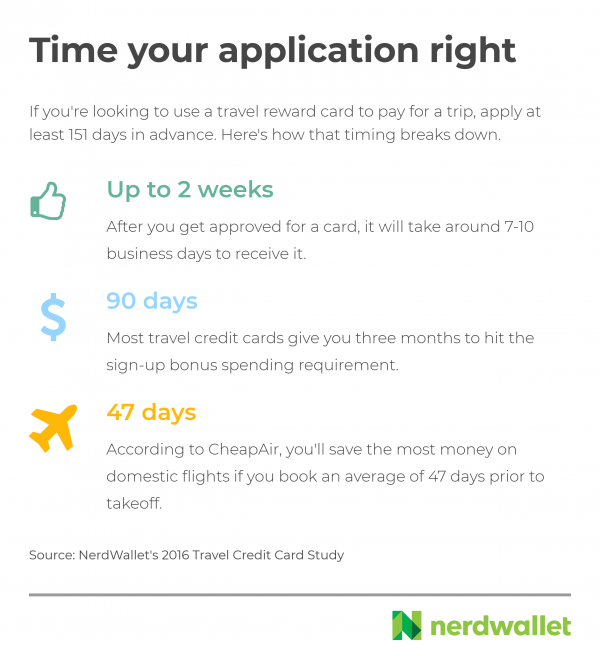 According to the new NerdWallet study, the average American who puts all applicable expenses on a travel credit card could earn $901 in travel rewards during the first year with the card and $277 per year afterward, after taking into account the annual fee. Those who don’t use credit cards for everyday spending miss out on those benefits. More than one-quarter of Americans who don’t currently have a travel credit card (29%) say it’s because they don’t want to pay an annual fee. Although an annual fee is often worth paying — higher rewards rates and valuable perks can easily make up for it — smaller spenders and the fee-averse can find travel credit cards without this cost. When your card has no annual fee, you’re always “in the black” with your rewards, eliminating the need to spend money just to break even. By contrast, if you have a travel card with a $95 fee and 2% rewards, then the rewards on your first $4,750 in spending each year are effectively canceled out by the fee. If you don’t spend a lot on the card, then the fee probably isn’t worth paying. * Keep in mind that many travel cards come with credits and other perks that reduce the annual cost. For example, if a card with a $450 annual fee gives you $300 a year in credit for travel expenses, then the effective annual cost of the card is $150. Three in 5 Americans (60%) think the best time to get a travel card to use the sign-up bonus is less than five months before their trip. In reality, five months prior is the absolute minimum, according to a 2016 NerdWallet study. If you’re planning on getting a new travel credit card, apply as far in advance of your trip as possible. NerdWallet’s new study found that the average American can qualify for top travel cards’ sign-up bonuses just by putting regular expenses on their new card for three months. You won’t have to overspend to rack up rewards because the bonus will provide a big influx of points to pay for, or at least heavily subsidize, your next trip — provided you get started early enough. Need help breaking the cycle of overspending on your credit card? Check out NerdWallet’s quiz to see whether overspending has become a habit for you, and how to avoid it.